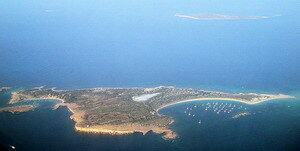 Formentera is a amall island, located 11 miles from the south-eastern coast of Ibiza. Lovely sea views from all over the island and beautiful beaches and bays. Favourable climate year around and a calm and relaxed ambience make this island a true paradise. Accessible from Ibiza island by ferry. Formentera is the smaller and more southerly island of the Pitiusic Islands group (comprising Ibiza and Formentera, as well as various small islets), which belongs to the Balearic Islands autonomous community of Spain. The island's name is thought to have derived from the Latin word "frumentarium", meaning "granary". Formentera is 19 kilometres (12 miles) long and is situated about 6 kilometres (4 miles) south of Ibiza in the Mediterranean Sea. Its major villages are Sant Francesc Xavier, Sant Ferran de ses Roques, El Pilar de la Mola and La Savina. A local Ibizan (eivissenc) variant of the Balearic dialect of the Catalan language is spoken in Formentera. While the official languages are Catalan and Spanish, other major languages like English, Italian, German, French and Dutch can also be heard extensively in the summer due to mass tourism. Easpalmador - Photo courtesy Coniferous To the north of the island is another island, Espalmador, which is part of the same municipality as Formentera. 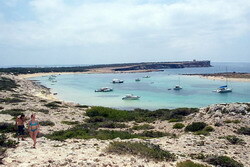 The island is separated from Formentera by a shallow sandbar and at low tide, it is possible for one to wade between the two islands. This area is a popular stopping point for those in yachts heading between Ibiza and Formentera. The island is particularly popular for its endless sandy beaches and for the fact that, while the roads are paved and car hire available, as the island is mainly, flat cycling is a great way to get around. Playa Migjorn - This is the longest beach on Formentera, measuring nearly 5 km and occupying all the south coast of the island. Surrounded by a beach with abundant vegetation such as pines and scrub. The Insotel Hotel Formentera Playa is a self-contained holiday complex situated on Formentera's Pretty Migjorn beach, on the south side of the island. Guests can enjoy a swim in the indoor pool, or simply relax on a sunbed by the outdoor swimming pool with a drink from the pool bar. Kids will enjoy the children's pool and there are supervised children's activities; parents will appreciate the babysitting service. At the main restaurant guests can enjoy buffet style dining, while the grill restaurant provides an à la carte menu in an informal beach side taverna. Studio units open to balconies or terraces and provide direct-dial phones, satellite television with music channels, safes, kitchenettes and bathrooms with hair dryers. Enclosed by dense pinewood, the Insotel Club Maryland's complex of Mediterranean style bungalows is arranged directly on Formentera's Migjorn Beach. An oasis of four swimming pools occupies the whole family, while the poolside bar offers a shady retreat to relax with a drink, with hotel supervisors on hand for babysitting and organising the daily children's activities.The hotel also houses a well-stocked supermarket, medical services, and a 24 hour front desk manned by multilingual staff. All 325 apartments feature modern, Mediterranean-style décor, furnished balconies, refrigerators, microwaves, and lounge areas with cable television and telephones. When staying at RIU La Mola on Playa Migjorn in Formentera Island, you will be close to the beach and La Mola Lighthouse. The hotel is also close to Es Pujols Beach and Cap Barbaria Lighthouse. The hotel offers an outdoor pool, health club and a steam room. Guests also have access to complimentary wireless Internet, babysitting/childcare (surcharge), and gift shops/newsstands. For dining, there are two restaurants available and guests can enjoy a refreshing drink in the bar/lounge, poolside bar, or swim-up bar. This modern hotel has 324 air-conditioned rooms featuring minibars and flat-screen televisions, and all with private balconies.